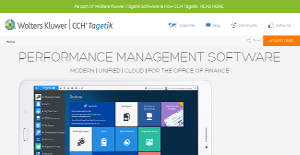 CCH Tagetik is a corporate performance management software for budgeting, planning, consolidation and reporting. It suits business of various size and verticals. The solution has an integrated financial intelligence to help you gain more insights on and visibility of your company’s health. Its core modules are budgeting & planning, management reporting, modeling & forecasting, disclosure management, consolidation & close and analytic information hub. The UI is simple and neat empowering executives with business performance tools they can use at their fingertips. Users will find the interface with Excel-familiarity, while they’ll enjoy discovering the different ways to slice and dice data for performance analysis. CCH Tagetik is used by about 1,000 customers and 75,000 users in more than 35 countries. These customers use the financial performance platform to automate complex business processes that affect financial results and drive business decisions. The increasing demands on the Office of Finance and the strategic role of the CFO drive the company’s mission to deliver high-quality corporate performance management systems. CCH Tagetik is adaptive to different planning approaches, whether you’re building a process from scratch or adopting the system to an existing one. If you have existing data scattered across old Excel spreadsheets, you can easily integrate the system and start tinkering with your data for drill-down analysis. Tagetik combines cloud-based and on-premise software solutions to form a tightly integrated, intuitive financial management platform. You can generate real-time financial insights using a host of dashboard-based chart visualizations and customizable reporting options. Plus, you can make use of embedded business intelligence including double-entry accounting logic, time dependent hierarchies, and currency translation. Give finance units data control and full visibility from planning and organizing workflows to reporting, analysis, and forecasting. Plus, Tagetik integrates seamlessly with existing systems including BI and analytics, CRM, ERP, and relational databases, and partners with Qlik, SAP, and Microsoft. You can create “what if” insight models based on real-time data to get immediate insights on cashflow, profitablility, and performance. Plus, you can combine the ease of online access with Microsoft Excel and automate your budgeting processes irrespective of methodology. The benefits of CCH Tagetik include shorter cycles, greater insight, lower TCO, and smarter decision-making. You can use this software to work more efficiently and productively and with less risk. Plus, you can eliminate manual repetitive activities and use your time to execute effective business strategies that give you results and profit. Collaborative disclosure reporting such as board books, etc. Create “what if” insights on cash flow, profitability,etc. There are trendy and widely used applications in each software group. But are they necessarily the best fit for your organization’s unique needs? A popular software solution may have thousands of users, but does it provide what you require? For this reason, do not blindly spend on popular systems. Read at least a few CCH Tagetik reviews and mull over the aspects that you wish to have in the software such as the cost, main functionality, available integrations etc. Then, shortlist a few apps that fit your wants. Try out the free trials of these platforms, read online comments, get information from the seller, and do your homework meticulously. This in-depth homework is sure to aid you choose the best software solution for your company’s specific wants. How Much Does CCH Tagetik Cost? CCH Tagetik’s enterprise pricing is available only upon request. Please contact the company for more details, and ask for your quote. We realize that when you make a decision to buy Accounting Software it’s important not only to see how experts evaluate it in their reviews, but also to find out if the real people and companies that buy it are actually satisfied with the product. That’s why we’ve created our behavior-based Customer Satisfaction Algorithm™ that gathers customer reviews, comments and CCH Tagetik reviews across a wide range of social media sites. The data is then presented in an easy to digest form showing how many people had positive and negative experience with CCH Tagetik. With that information at hand you should be equipped to make an informed buying decision that you won’t regret. What are CCH Tagetik pricing details? What integrations are available for CCH Tagetik? If you need more information about CCH Tagetik or you simply have a question let us know what you need and we’ll forward your request directly to the vendor.